Heavyweight, unbreakable cast aluminum lanterns. Antique-look seedy glass keeps the wind out, an aluminum heat shield keeps the lid cool and secure. 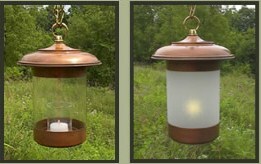 In the garden, on the deck, beside the fireplace…few places wouldn’t benefit from an artfully placed Craftsman lantern. Their warm and cheerful glow, alone or in a dramatic group, is a welcome comfort anywhere. Durable powder coated finishes won’t discolor or fade. 9”, 15” and 20” high x 7” wide. Sitting or hanging, our copper Adirondack Lamp sheds windproof light. Available in antique-look clear or frosted glass with a glowing copper finish, it’s suitable for use indoors or out. Solid brass top hook stays cool to the touch. The Adirondack Lamp comes with a glass votive cup, but small oil cartridges can be used as well. Antique or polished solid brass hook sold separately. 7” wide x 10” high.